Rang means ‘Colors’ in Hindi. Hindi is one of the official languages of India. Rang Outlet is an online store that brings you the best of Indian culture with a global twist. 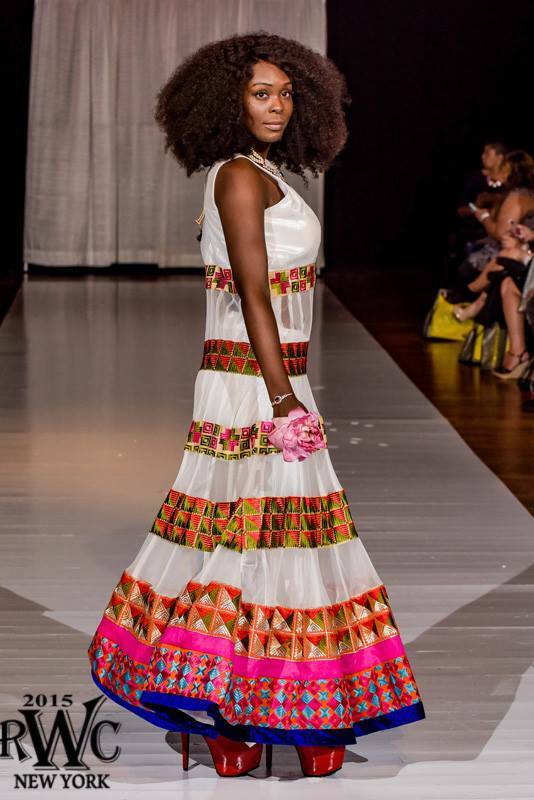 They showcased their products at Atlantic City Fashion Week in October 2015. RangOutlet.com is eCommerce based one stop shopping outlet for Indian Ethnic Wear serving to community in USA and Canada. USA’s first online Indian Ethnic Wear outlet with huge variety of premium branded products from across the India. Our goal is to provide high quality branded products, unique shopping experience and 100% customer satisfaction. 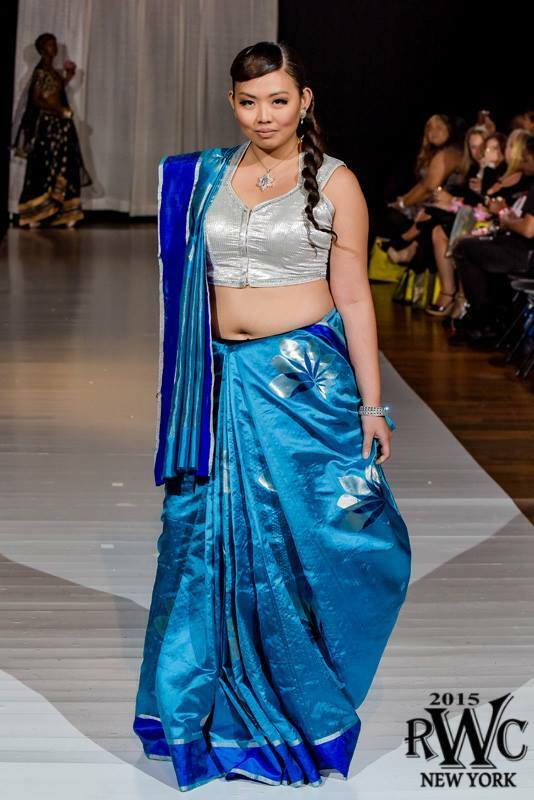 Atlantic City Fashion Week’s fashion show was conceptualized with the Hindu Goddesses in mind. Each one of the models carried a fresh lotus flower which is the National flower of India. Lotus flower is also associated with Goddess Laxmi who is the patron of wealth and prosperity. During their walk the models gave the auspicious flower to a lucky audience member. They did so significantly to share the prosperity. Nadia Etemad‘s look originates with the Indian Saree. The design consultant gave her neon green and gold colors to make it look festive. Although popular in all parts of India, traditionally this outfit is worn by South Indians. This is also the common style seen in Bollywood films. Nadia’s outfit is complimented by jewelry and a clutch. Anarkali is a popular Indian outfit often consisting with underpants, a sash and a flared tunic. The pictured white tunic has bands of ethnic embroidery often found in parts of Gujarat and Rajasthan. Venus Freeman‘s outfit has an underskirt instead, and she flaunts some skin with her netted tunic. She pairs it with a large necklace and a pair of knockout earrings. Her red heels and an embroidered clutch take her fashion quotient up by a notch. 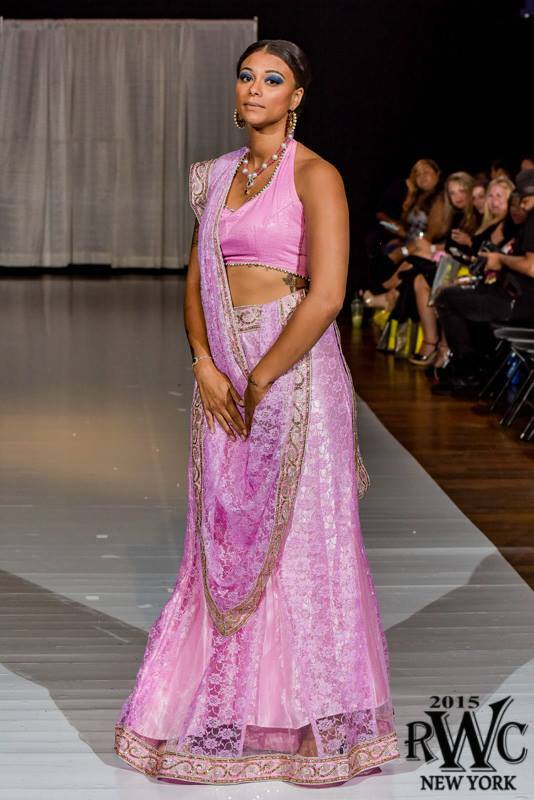 Elona Mitchell‘s outfit is a perfect nod to Bollywood, the Hindi film industry. Her three piece outfit contains an A-line skirt, a halter neck blouse and a long sash called ‘Dupatta’. Hair parted in the center, beaded earrings, a pink beaded necklace and a diamond bracelet complete her desi filmy look. Desi is a loose term for the people, cultures, and products of the Indian subcontinent or South Asia and their diaspora, derived from the Ancient Sanskrit word देश (deśá), meaning country. Another Anarkali in black. This one is designed by Sabyasachi Mukherjee. With gold details on the bottom, this one piece outfit is long sleeved with gold buttons to clasp around. Model Laura McLaughlin pairs it with black and gold earrings. A matching black clutch with gold details adorns her hand. This shade of cream is a hand painted silk Saree. The painting tells a story of Lord Krishna and Radha. 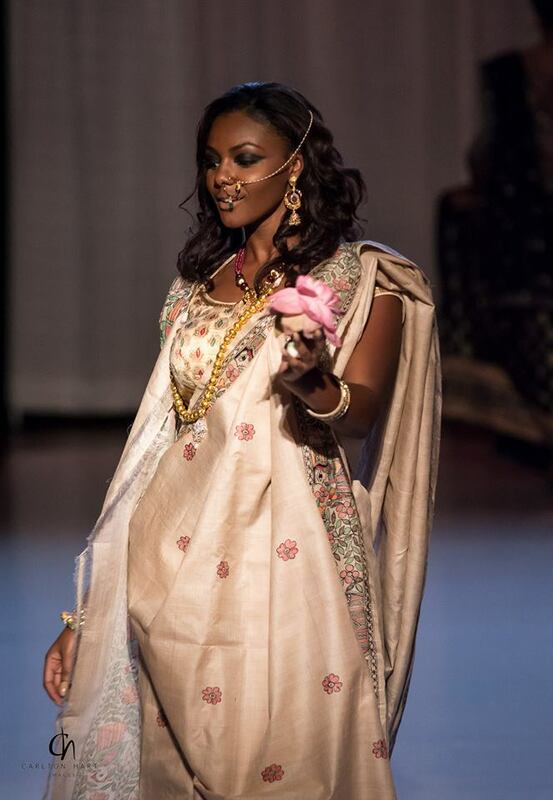 Model Tiana Allen wears in in the Bengali style. Intricate jewelry such as necklaces, bangles, earrings and a nose pin with a string of pearls completes her Bengali look. The composition is a stellar example of Indian craftsmenship. It is a combination of a lengha – the skirt, a tight choli – blouse, and a Dupatta – the sash. This outfit is more common in the northern part of India. Netted and silver embroidery make is outfit look smashing. Pair it with some silver bling jewelry like model Stephanie Rogers and you are set to rock at an Indian wedding. Sufism is an inner mystical-ascetic aspect of Islam. Often associated with seekers of divine truth and love, Sufi culture includes Arabic, Persian, Turkish and Urdu ethnicity. Model Jessica Poletti sports the fully covered outfit with palazzo pants, flared tunic and a head scarf. She also wears a Jhoomar which is a fan shaped ornament worn on the side of the head along with matching earrings. This outfit is commonly worn by women in Hyderabad, India. Rooting from the Vedic period, Chanderi is believed to have been founded by Lord Krishna’s cousin, Shishupal. It is one of the finest handloom clusters, for its fine cotton and silk texture embellished with zari. Patronized by royalty, Chanderis are known for their sheer texture, light weight and a golden haze that sets them apart. Crafted by the nimble fingers of Indian artisans, the motifs on these sarees were seen on Mughal forts, palaces, and other architecture. The traditional chanderi is given a contemporary touch through the use of a vibrant colour palette. 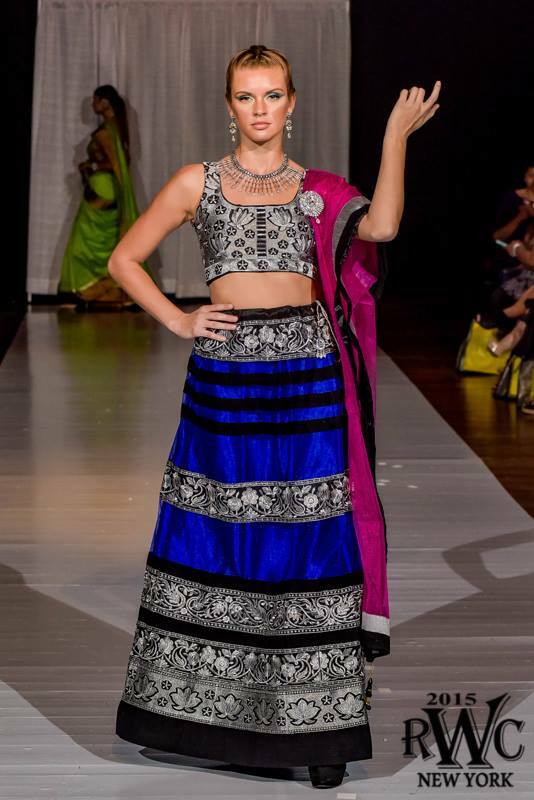 Model Marie Shayne Lao wears it in the Gujarati style of draping along with a silver blouse and accessories. Ghagra is a form of skirt which is long, embroidered and pleated. It is worn as the bottom portion of a Ghagra choli. Ancient unstitched form of ghagra has survived in folk theater costumes across India, particularly in Kathakali of Kerala, where layers of pleated khadi fabric are laid over a nada and tied around the waist creating layers of flared skirt. This reflects simplistic early style of unstitched ghagras worn in ancient times. 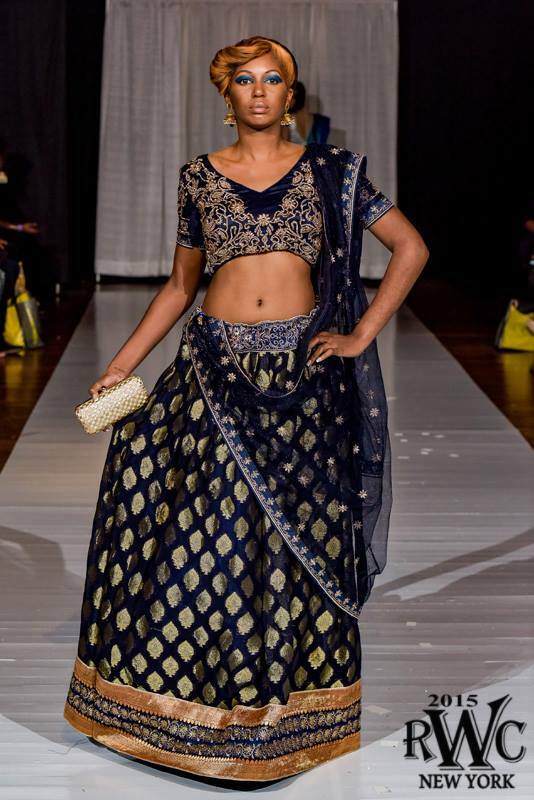 Model Kiana Newman wears the navy and gold brocade ghagra with a traditional fitted blouse, a dupatta and bell earrings. 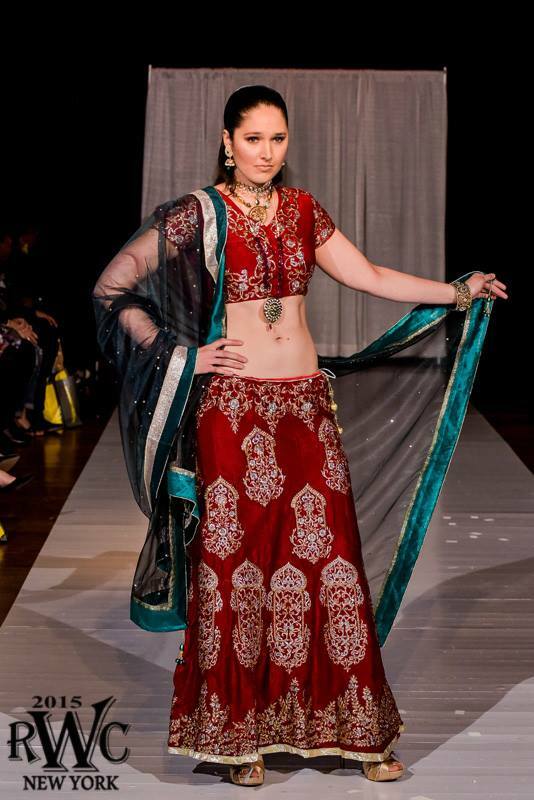 Showstopper Sarah Jane Caldwell graced the onlookers in her red bridal lengha. This three piece outfit has a skirt, blouse and dupatta – known as sash. She wears heavy jewelry including pearls and diamonds. She pairs the outfit with a green sash and gold heels to complete the look. 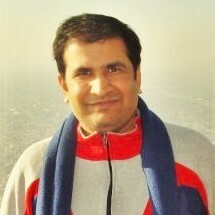 Hemant Khatri is the Founder and CEO of www.RangOutlet.com. Their headquarters are located in New Jersey, USA where Hemant lives with his wife Leena, daughter Hetvi and son Maharsh. For questions and queries feel free to contact Rang Outlet, 948B Village Drive W, North Brunswick, NJ 08902, USA. Customer Care Phone: 1-781-985-0075. Customer Care Email: care@rangoutlet.com.